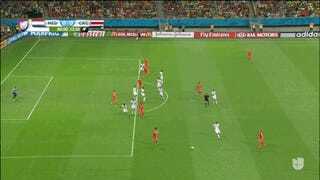 Robben went down very easily on this run—though perhaps he took a tiny shot to the pelotas?—and earned the Netherlands a free kick late in the game. Costa Rica were immediately unimpressed and called it a dive, but the ref showed yellow, anyway. Wesley Sneijder stepped up to take the shot and blasted it off the woodwork. So close. 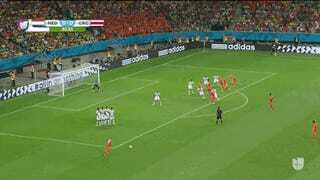 The Dutch had another late flurry, again off a set piece, but came up empty. After a Robin van Persie free kick, the ball rolls all the way across the mouth of the goal, leaving the tender out in the middle of nowhere, back to Robin van Persie, whose shot is deflected up into the crossbar by two Costa Rican defenders and somehow does not cross the line. Just look at van Persie, he's beside himself. We remain knotted at 0-0 and extra time has just begun.